I think I was in Washington DC long enough. Last night I had a dream that he and I hooked up, well kinda. The G rated version of the dream went something like this. We were making out and I wanted more so I told him and he turned me down! Oh, the nerve of him, but a good dream non-the-less. It's a bit past midnight, I'm, laying on the blow up bed surrounded by boxes, almost floor to ceiling, wishing I was home. It's been nothing but wedding since I first got here. I haven't had one moment to do anything just with The Bride. It's always her, Mr. Wonderful and me. Long gone are the days where the two of us shop, have lunch and see movies. The new reality is there's three of us and often times three feels odd. I need to get use to the fact that the friend I had is not the same person I know today. The girl I know today no longer makes any decisions on her own, no longer wants to do things that we shared before and no longer has that something about her that I loved. It seems like the old her has fallen into a black hole. No where to be found. Getting married, to me, doesn't mean losing oneself. My friend, has sadly gone that route. We'll still be friends, but I know it won't be the same. It's not because she's gone totally mad about the wedding details, but because she no longer is here. She has lost herself and she has become they. So this is the second time in as many months that my former boyfriend, who I seriously think is a closet gay, has emailed me to tell me he dreamt of me. Well there you were again, in yet another dream of mine last night. Im prohibited by law (in only 34 states though) and most churches from sharing the contents of said dream but Im sure I read something somewhere that Im supposed to share. Or maybe I was supposed to write it down in a private journel to comtemplate later? TH: So are you at all looking forward to this weekend? That right there pretty much says everything. This is why The Husband-to-Be's shouldn't get involved in planning a wedding. So, in terms of the dresses... Mr. Wonderful is concerned that the quality of the Ebay dresses might not be great. Have you ever ordered from them? He suggested that we could take a run down to the mall to a couple of stores his mom suggested and look at the dresses this weekend. He's willing to drive us around, so that's good. What do you think? I seriously, think I need to up my blood pressure medication, fast before someone gets hurt. Really hurt. And an update. I did tell The Bride not to expect The Little Miss to walk down the aisle, but now her new job is to help hand out programs. So, The Bride is still determined to find something for her to wear. Although I am still shaking from reading that email about the dress this morning, I want to thank you all for listening to my rants, I can't tell you how much it helps me just process the absurdity of the situation. I just wish we were all together, so I could buy you a cocktail and thank you in person. We had Mr. and Mrs. Fire over with their 2 girls over on Sunday for a little afternoon craziness. The girls ran around the backyard doing whatever it is that kids do to entertain themselves. The adults caught up on stuff like, have you found a place to rent and really how much is the insurance going to cover? So far they have only gotten a check for $600, for living expenses to hold them over until their situation can be further assessed. There will be a lot more money paid out, as in hundreds of thousands of dollars but right to rebuild their house, but for now they are fronting all costs. They were given a work book to list everything that was in the house so they can be given money for the replacement value of it. For example, let’s say you bought a TV 5 years ago for $1000 and to replace that same TV today is $300, the insurance will give you the $300. Can you imagine trying to list everything in your house? Take pictures people. Open your closets, cabinets and drawers and snap a quick photo. It takes a while but in a situation like this, totally worth it. Here’s the scenario and question of the day…Mrs. Fire went out last week to buy an outfit for a friend’s party, since she basically has only one suit case of clothes. She went out and spent $525 on a pair of shoes, a pair of black pants, a pair of jeans, a blouse and a cardigan. A. Splurge because, WTF… I just lost EVERYTHING and deserve to buy my self a little bit of happiness? B. Be conservative with my money because I just lost EVERYTHING and I there’s a lot of things I’ll need to replace? And a wedding update (or rather another RANT) and the 2nd question of the day. Now The Bride wants to have another flowergirl along with The Little Miss and wants to co-ordinate dresses for the girls. Should I just bow out of having The Little Miss be a flower girl, since I'm fairly confident she won't walk down the aisle in front of all 200 guests all by herself? The original plan was that if needed, she would walk with her Dad or I would walk with her. I'm leaning toward bowing out. What do you think? The past couple of weeks have been a train wreck for me eating wise. I feeling really gross and feeling like the time has come to get back on track. It’s not really that hard for me to switch things back in gear since I eat pretty healthy to start with. For me it’s more a question of portion size. Need to cut those back and I’ll be back in the saddle. 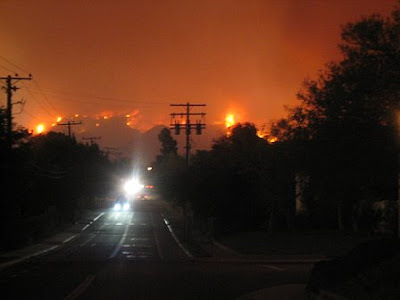 It’s been hard to go on walks since there is still ash floating in the air and the sidewalks are covered. You can’t go barefoot anywhere without the soles of your feet turning black. It’s still coming down, a light dusting and everyday we’ve been sweeping or washing off our deck, patio furniture, plants and what not. No hanging laundry outside to dry since it will get dirtier out there than when you first washed it. In other news… American Idol. Danny is gone. Now, I could care less about the finale. I can’t stand Adam, his screeching and overplayed emotion and him trying to “connect with the song.” He’s gross. And what’s that other guys name? Oh, yeah, Kris. I don’t care for him either. Oh well. Maybe they can bring Danny back. Wedding update: The dress I was going to borrow for the little miss was burned to ashes in the fire at the friend’s house so I’m back on the hunt. The Little Miss has specifically said she wanted to wear “a pink twirl dress.” I found this one on e-bay, what do you think? I think I’ve nailed down my shoe situation and will getting these and not these like The Bride had suggested. I fly out to DC next weekend to throw The Bride a shower, which is turning into a small little affair. So far only 5 people can come and haven’t heard from about 8 people so the most would be 13 guests. I can totally handle that. Is there a reason people don’t RSVP? Are they waiting to see if a better offer and will respond a day or so before? Come on people, there’s planning to be done. We had the Fire Family over last night and what a mess they are. It was a hard night. At any given moment, tears fell. Heads turned to keep the kids from seeing our moments of intense emotion. So much loss. They are living in a hotel until they can manage to find a place to rent. A place they can call home, until they rebuild a house. We did Mrs. Fire’s laundry for her. The 2 shirts her husband has. The one sweater she has. The small handful of clothes for the 2 kids. Not much. It wasn’t the 16 loads of laundry she was use to but 3 small loads of almost everything they have. Sleep has eluded the parents. Nights filled with worry. So much to think about, figuring out how to navigate putting your life back on track. Making things stable for the kids. Worrying about money, insurance, the marraige and the future. There are many lessons I am learning from this. First and foremost is that material possessions are ridiculously overrated. It’s just stuff. It’s ok not to have the 4 personalized lunch boxes. It’s ok to have only one pair of jeans. It’s ok not to have the cute sparkly pink kid plates. It’s just stuff, you don’t really need it and you are still you even without them. Sadly, we live in a place where material goods are used as a marker of ones success. We can complain all we want, but we need to take some time to remember how lucky all of us truly are. In the grand scheme of things, even the most disgruntled among us is living better than 99% of our fellow inhabitants on the planet. It didn’t seem too much like Mother’s Day around these parts on Sunday, but I have to say The Little Miss made me the cutest sweetest thing for me. At school the teacher takes each child aside as asks them a few questions about their mother. She’ll ask the same questions each year so we’ll be able to see the difference in their language skills and articulation. She prints the answers up and has the kids decorate a frame for it. Here’s what mine said this year. What ‘s the best thing she does? There is something so sweet and innocent about those answers. I am so grateful that she made me a mother. .4 miles, that’s how close it came to burning our house. 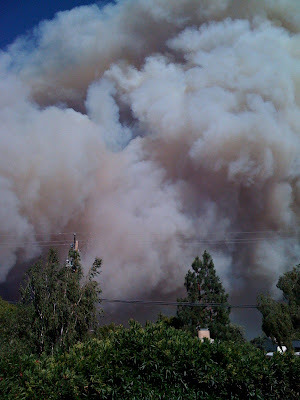 We were able to return, with a bit of guilt, to our ash covered home on Saturday. Even though we were at a friend’s luxurious Club Med type of place during our homeless state, it was nice to go back. I thankfully unpacked my bags. No longer homeless. I carefully put back my irreplaceable belongings. Hung the pictures and paintings back on the wall, thinking to myself, we’re home. Our closest friends, however not so lucky. They lost all their belongings except what they could put in one car. I can’t imagine. My friend left on Tuesday to pick up her girls from school, went to go home and the road was closed. Left her house for a regular errand and wasn’t able to go back. Her husband was able to go in the house and grab a few things. One carload and that was it. Their immediate need is to find a place to call home, for now. I went shopping for the girls on Saturday. Color books, crayons, dress up clothes, hair bows, lip gloss, princess purses, bathing suits, and dresses. Fun things. Not the stuff they really need, but hopefully something to let them know it’s okay and that they will have normal again. I’m ready for normal. With the death of The Uncle, the fire and the news of our friends home. I’ve been a mess. I just sit and cry sometimes. I’m emotional. I liked when I didn’t have anything to write on this blog. The days when the cursor would just sit and blink. Blink. Blink. There is a lot more to share about this experience. How it has seemingly deeply affected me. I feel like a different person right now. I feel a little lost, but for now, thank you all for your heart-felt wishes. We are fine. It sure felt and looked like it. With cars packed, we left. The neighborhood, now deserted. Nothing there for us to do, but wait. The Husband went back this morning to check. All was still there, under a thick layer of ash, untouched. 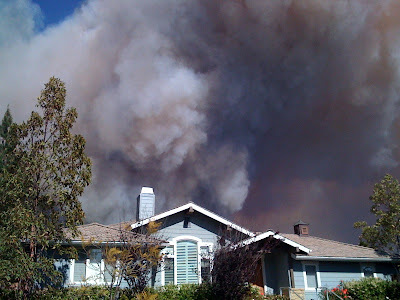 We’re at a friend’s house, but now as of this morning we found out their home is in the evacuation warning zone. The prediction for tonight are for the same hot violent winds. Anything could happen. Thank you all for your kind words, thoughts and prayers. We are safe. Our family is together. The other things, replaceable. It was a scary feeling. 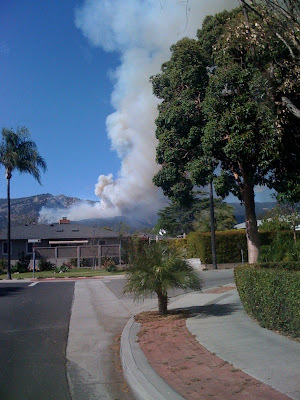 I came home from picking up The Little Miss and saw massive amounts of smoke billowing from the hills just above my house. Making it even more surreal was watching as my neighbors had handfuls of pictures, boxes, clothes, mementos of a lifetime trying to be fit in the back of cars. Me? I had a small bag packed with our passports, tax returns, insurance policies and a few tokens already in my car, just in case I couldn’t get back in the house from being out. In my panic, I called The Husband, telling him I was going to pack up and leave. Really? He said? Is it that bad? And for me, at that moment it was. Panic. Still in the warning zone, not the you-have-to-leave-right-now zone, but still. My heart racing. Turning my tears away from The Little Miss. I’m suppose to be strong. Hold it together. Stay level headed and pack what you need. But am I packing as if for a night away or packing for my house is going to burn down? 2 totally different things. It could be worse, I tell myself. And it is for some. A lot worse. It’s calm now, but I suspect not for long. Strong hot winds, the Santa Ana’s as they are called, are being predicted again for this afternoon. Again, the sound of helicopters flying above. The wind howling. Smoke. Ash. Glued to the television, waiting for news. Do we leave? Stay? Bags are packed. Friends call to offer their home to become ours if needed. We wait, knowing we are ready for the unknown. Keep rubbing salt in my wounds because it doesn’t really matter anymore. The wedding shower invitations went out last week. A week ago to be exact. I sent one to her because I thought she’d like to see them. And, I sent one to her because I think they are cute and wanted to hear to say something like, “oh, I love the invitations.” I wanted some acknowledgement. Something that might seem like a bit of appreciation. Did I hear back from her on that? No. Nothing. Disappointed? Yes, a lot. Surprised? No. Silence about the shower, but I did get an email with a link to these $75 pair of shoes that aren't even that cute, she is suggesting and an email to all the bridesmaids about the hair and make-up she is wanting us to pay for. Seriously? So for now, all I have to say is F-you bride. I think there should be a support group for bridesmaids and until I find one please feel free to leave a comment on what a great friend I am, how unreasonable The Bride is being and how cute the invitations are even if you haven't seen them. I really didn't have much to bloggy about today so I thought I'd come up with one of these list thingys that I always find fascinating and fun to read.